Thanks to Vevo Dscvr's Ones To Watch 2017 list I just heard this song for the first time and to say that I am shook would be a severe understatement. As it finished I was nearly in tears that I had stumbled upon something so fresh and innovative and good for music in 2017. You know I mean business when the video is at the top of the post rather than at the bottom. 070 are a crew from New Jersey and they are quite legitimately about to turn your life upside down. Fronted by 19 year old Shake, I don't think there's anything that could prepare a human for the music this crew is making. So let's talk about 'Honey'. This track was originally released way back in August but the video above is brand new so like who cares about dates and stuff. 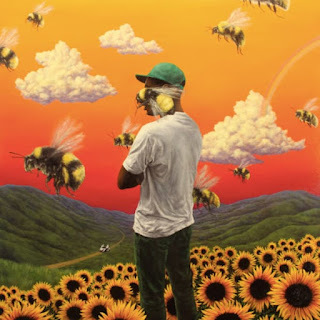 'Honey' appears on 070's album The 070 Project: Chapter One which was released last month. There's an absolute lifetime's worth of material on there and something for everyone, although alongside 'Honey' my favourite tracks were Shake's 'Through The Speakers' and Treee Safari's 'My Niggas', just so you know. So what's going on here? First of all, Shake's vocals are so different, stuck somewhere between singing and rapping, yet still creating these catchy and repetitive lines. But if that's Shake... then who the hell are all these other people? I mean, this backing dancer routine is cool but is that all these three are going to do for the next six minutes? Enter Ralphy River, the second in command. Another artist who is beautifully lost within this singing to rapping void and he compliments Shake so well. It's at this moment it all suddenly makes sense and I am in my element. The love interest is my honey, she stings like a bee, I don't know how to feel about her, I don't know how she feels about me. Then in came Hack and I was physically and mentally shook. First I was all, "how dare he turn up without a shirt on" and that rapidly turned into, "oh my goodness, I think I'm pregnant". I think, what I'd refer to as the "middle eight" from Shake is my favourite part of this track. It's fascinating that this track is so exciting and energetic but there's this heartache at the crux of it. And just as you're on the brink of tears at how incredible this six minute long journey has been thus far, Treee Safari is here to tip you right over the edge. When was the last time you heard that much emotion in one person's voice when they are quite simply repeating the same two lines? More than anything, I'm in love with how much fun the four of them are having in the last twenty seconds of this video. Have you seen a group of people have a better time performing in front of a production crew? Nah, didn't think so. Here's the studio version of 'Honey' in case you wondered what that sounded like.